Claim settlement ratio will not help you choose a term life insurance policy! Claim settlement ratios (CSR) published by IRDA do not represent the probability of claim acceptance. Most private insurers have a claim settlement ratio comparable to that of LIC. Therefore the CSR will not help you choose a term life insurance policy. At best, CSRs would help you reject a few insurers. Here are some insights from IRDAs Annual report 2016-17. The claim settlement ratio should have never been a criterion for selecting term insurance policy because there is zero evidence to support it Thanks to irresponsible bloggers and reporters, it became popular. Search for “claim settlement ratio” in Google today and the first link’s title is: “Claim Settlement Ratio for Term Insurance by IRDAI”. Google may be using AI, but it is still an algorithm. Who will educate it that IRDA does not differentiate between CSR of pure term life insurance and investment-mixed policies which are still extremely popular? We have no idea what kind of policies were involved. We do not know how the deaths occurred – death claims are fairly straightforward, but still there are exclusions. If you see a blog post that says company A has CSR ~ 91% and B has CSR ~ 96%, will you conclude that B is better than A because 95% is better than 91% right? We have this tendency to assume that only the insured are the victims and if a claim is denied the insurer is a cheat. There is again no data to support this. If there are genuine claims, there will be genuine claim rejections. The claim settlement ratio does not differentiate between rightful rejection and a wrongful rejection (which can be appealed against). I don’t see how there is any logical way to choose B over A. The difference is not significant. A couple of years from now, A could have a higher CSR than the present. You could buy from B today and next year, it could fold and merge with A! If you have made an honest application (!) then a difference between a 98% CSR and 90% CSR is meaningless. 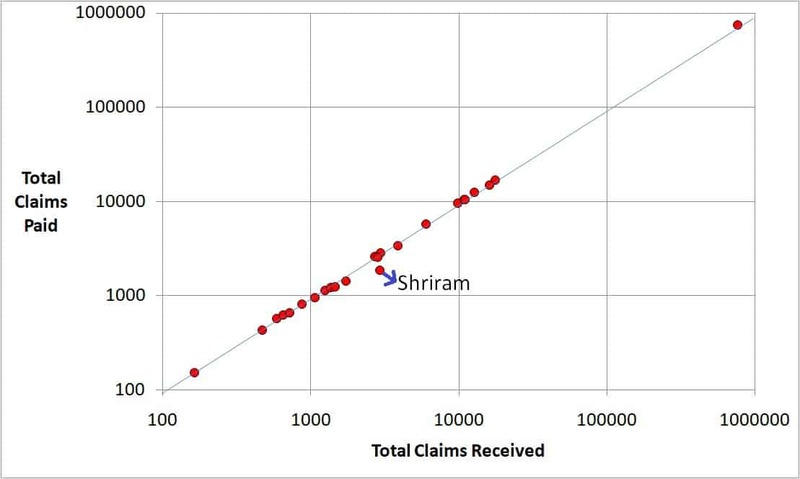 Why do people look at the claim settlement ratio? 1. They either cannot afford LIC or do not wish to “waste money”. LIC has the highest CSR right? Why are you then looking elsewhere Mr. logical? Please don’t say balance cost with peace of mind – the data does not help in that. 2. Making a choice is hard. If we shop at Amazon and see 400 reviews with an overall 3-4 star rating, it means many have had a good experience with the product. Even though some people think one-star = 1st rank or give that rating for delivery or payment problems, we assume most of the good experiences are proof that the product is good. Nothing wrong with this, after all, right from school we want “solves examples”.So people want some ratification of their choice. some social proof. Unfortunately, only a nominee or a ghost can tell you “how good a term insurance plan” was. 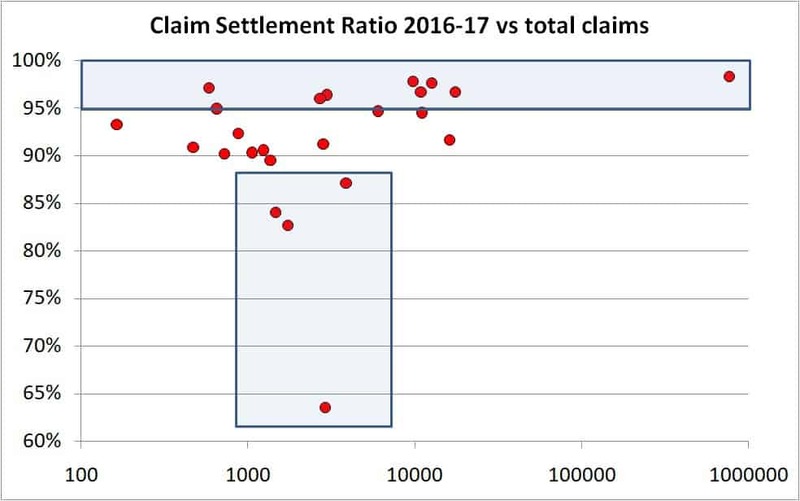 Since this information is not available, we look at claim settlement ratios – something is better than nothing, no? Well, not if it is wrong. The lack of confidence in making a choice leads us to take baseless reasoning seriously. Thankfully CSR based logic is en route to a peaceful death. Bloggers will continue to write nonsense with it though because people search google for such nonsense. Let us ignore all that written above and try to use the claim settlement ratio to select a term insurance policy. 1. Download the IDRA annual report in PDF form. 3. Copy paste the table into notepad first and then onto Excel. With a little bit of formatting, you can get this table. Notice that I have used a log-log scale (why?). 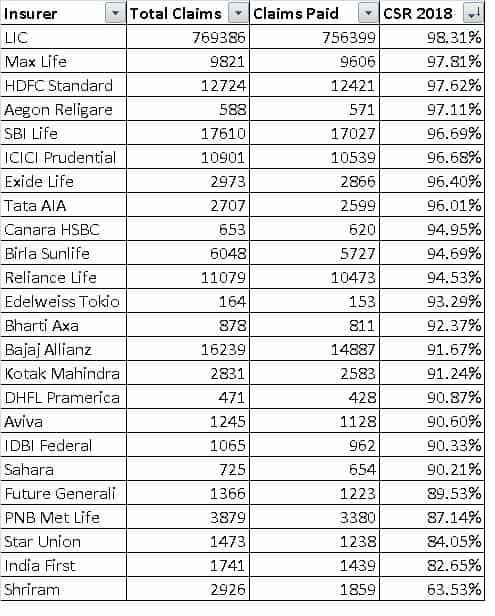 It is clear that LIC has the lions share of the market. The total claims received by all the private players in 2016-2017 is only about 14% of what LIC received. Therefore LIC rejected twice as many claims as the privates did (sounds bad when put that way, is it not?!). As the private insurers gain market share, you can expect them to move up that line as I have already shown here: How to choose a term life insurance provider in 30 minutes! Also see more analysis about CSR and IRDA annual report data here: How to Buy a Term Life Insurance Policy If you study past annual reports, the privates have steadily received more and more claims, therefore paid more claims and therefore their CSR has improved. In the current report, only one play: Shriram Insurance is off that line and its CSR is the lowest: 65.33%. It began operations in 2006 and by now should have had a CSR close to the 90s. – not a good sign. Out of 23 private insurers, 19 of them have a claim settlement ratio above or almost 90%. There is no meaningful way for you to differentiate among these. As long as these insurers stay in business, meaning they are selling more policies (not just term plans) – their CSR is likely to improve. It will take years for them to reach LIC’s market share (or never!). Consider this: LIC has rejected 12,987 policies this year for a CSR of 98.31%. Even if the rejection doubled, its CSR would only fall by 1.7%. That is the benefit of having a huge denominator. Even if you want an elitist 95% (again a meaningless boundary) and above CSR, you will still find almost 10 players in that window. So among them, you will always have to do an inky, pinky ponky. Let us face it, claim settlement ratio will not help you choose a life insurance policy. At best you can use it to eliminate the three insurers with less than 85% CSR. It should have never been a factor in the first place and I am delighted that it will not help in any major way. Ultimately it is down to your personal comfort level and how much you count costs. Tough luck! You will have to make a choice on your own! It will not help in any way!